Inchworms, also known as geometrid caterpillars, are from the family Geometridae, of which there are more than 35,000 varieties. Here we look at three of the most common. Inchworms are not actually worms, but the larvae of the Geometrid moth. These larvae are commonly seen floating around, dangling out of the canopies of trees. This behavior marks both a defensive mechanism and a fast method for the caterpillar to leave the tree top. Geometrid caterpillars evade predators by flinging themselves from trees and dangling by a silk thread that is attached to the tree trunk at the other end. If there are a lot of the worms in a tree at the time of predatory attack, it's possible that there could be several hundred worms dangling from a single tree at once. After the danger passes, they climb back up the silk and return to their leaf eating. Cankerworms are from the Geometridae family and eat the foliage of trees. When these worms gather in large numbers, they destroy the foliage in record time. Once the leaves are gone and there is no more food, the worms leave the tree by jumping and sliding to the ground on silk threads. There are two types of cankerworm, named for when they appear, in the fall (Alsophila pometaria) and in the spring (Paleacrita vernata). 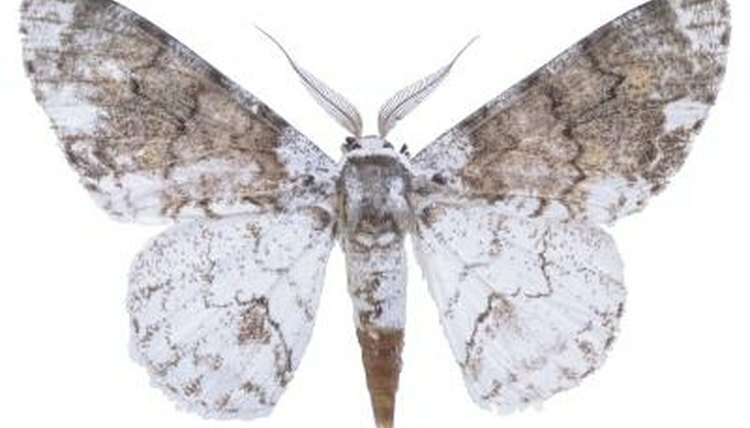 A recent arrival in the United States, the European winter moth, another member of the Geometridae family, eats leaves from ash, oak and maple trees, blueberry bushes, apple trees and some flowering plants, such as geraniums. This non-native moth larvae can quickly strip a tree in a short period of time if enough of the caterpillars are present. As with the cankerworm, these caterpillars will drop from the denuded tree on a line of silk. These caterpillars are yet another member of the inchworm family and they spend the winter in the trees as larvae and fall to the ground on silk lines in the spring where they spend the entire summer on the ground to enter the pupation stage in September. By November they are adult moths and ready to breed. These caterpillars do not completely denude trees but will do severe damage in large numbers and weaken trees.